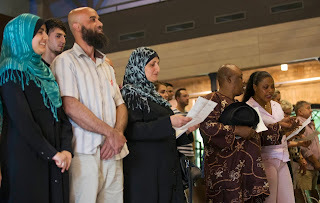 People sing the German national anthem at a citizenship ceremony at the Britz Estate in Berlin July 16, 2013. After decades of tending to depict the millions of residents of Turkish origin in Germany as a drag on society, policymakers are now courting foreigners and learning to be more inclusive. With elections approaching in September, the changing attitudes are reflected in the rhetoric of Chancellor Angela Merkel's conservatives. Picture taken July 16, 2013.